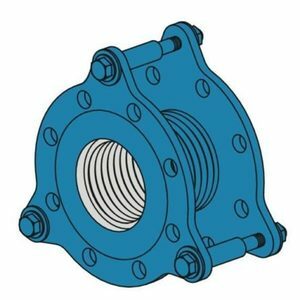 All bellows differ from Stainless Steel Hose in the corrugation configurations. Bellows are deeper and wider, and they are made of heavier material, to handle the pressures without braid. A very common location for our 2 ply Bellows is at the pumps. The face to face dimension is equal to the length of most Single Sphere Rubber Moulded Expansion Joints. This product should be used when a combination of short length with greater movement capabilities along with the other benefits of stainless steel (high temperature and pressure) are required. If the equipment is solidly mounted, and there is an anchor somewhere in the line on the other side of the bellows, they will accept 25mm of compression and 9 of elongation. Transverse movement varies between 3mm and 9mm, depending on diameter.